Fast food started as the great American tradition, but has evolved into a worldwide phenomenon. The food might be absolutely terrible for you, but what it lacks in nutritional facts, it makes up for in yumminess and price. Some people say they don’t like the taste of fast food, and they’d be lying. The food is greasy, caloric, but delicious. The invention of the drive-thru led to even faster ways to obtaining a meal on-the go and companies are starting to ride the meal train all the way to the bank. 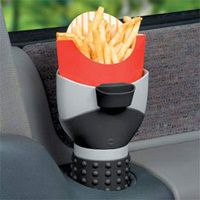 Available through the Improvements Catalog, this cupholder-mounted French Fry Holder is living proof that fast food is here to stay, despite the surge of health-conscious eaters. When you’re on a lunch break from work and stop for a quick bite at your local Burger King, since there is no time to sit down for a luxurious meal, many of you wind up fumbling with your food as you drive, which is not only an intake health hazard, but also quite a distraction. The French Fry Holder keeps your fries at a easy-to-reach spot so you don’t have to go searching for a fried slice of potato blindly. While it might not be the healthiest way to go about things, fast food is certainly a time saver, and doesn’t seem to be going anywhere anytime soon. It seems that Improvements is currently out-of-stock of the holders, but when they file back in stock, they’ll be sure to sell out again. If you want to get your hands on one, you better move quick. Hmmm…BK already solved this problem bu changing their packaging from oval to round to fit into cup holders. I’ll stick to the free packaging they provide.